International surfers battled it out in three-to-five foot (1 metre) surf at Supertubes today at the J-Bay Open, stop No. 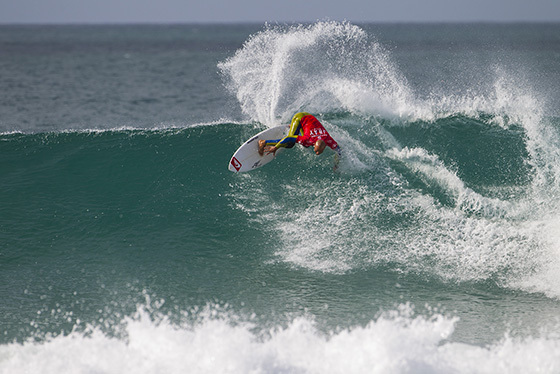 6 of 11 on the 2014 Samsung Galaxy ASP World Championship Tour. The field of 36 was narrowed down to 24 after a day of thrilling action in the barrelling waves that peeled through the planet’s premier high-performance point break, providing the world’s best surfers with the ideal canvas on which to display their talent. Hawaii’s Fredrick Patacchia was the top performer and was awarded both the day’s highest single-wave score (9.93 out of a possible 10) and two-wave total of 17.93 (out of a possible 20). Matt Wilkinson of Sydney, New South Wales, Australia (pictured) advanced into Round 3 of the J-Bay Open, defeating Bede Durbidge with a heat total of 15.93 points (out of a possible 20.00) in Round 2 at Supertubes, Jeffreys Bay, South Africa today. The day’s opening encounter was an all-Australian affair where Bede Durbidge took an early lead over Matt Wilkinson. But Wilkinson managed six clean turns and a smooth drift for a 7.00 and the lead and then extended his advantage with an 8.50, leaving his opponent in need of an excellent score. With under two minutes on the clock Durbidge found the opportunity he was looking for but the score came in just shy of what was required. Both former ASP World Champion C.J. Hobgood (USA) and Tiago Pires (PRT) got to work quickly in Round 2 Heat 8 with the Portuguese surfer gaining a slight edge over the American. The latter half of the heat was a see-saw affair as Pires produced bottom-to-top carves with fins-out vertical snaps for an excellent 8.17 before Hobgood answered with huge carves and a tight tube ride. An awkward fall at the ride’s end kept the score out of the excellent range but the 7.67 was still enough to put him ahead of Pires for his first WCT heat win since the Rip Curl Pro Bells Beach. The second all-Brazilian match-up of the day saw Jadson Andre face Miguel Pupo and with 15 minutes gone, the pair launched their respective barrel games. 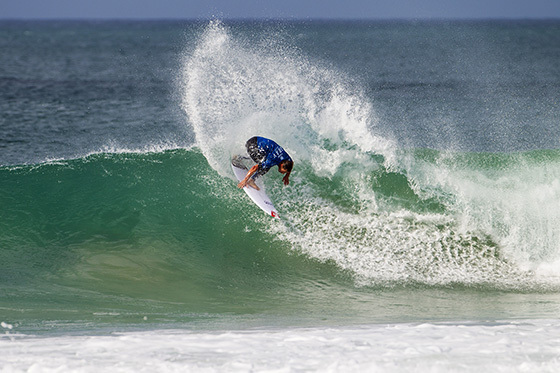 Pupo was able to secure a lead over his fellow countryman and, with renewed confidence, followed up with a long run down a clean wave for an 8.50 putting Andre in a combination situation. Despite replacing one of his low scores with an excellent 8.40, Andre was unable to overtake Pupo who, like Hobgood, secured his first heat win since Bells Beach and advanced to Round 3. Freddy Patacchia (HAW) took on South Africa’s Travis Logie (Durban) in a battle of the goofy-footers (ride with right foot in front). Patacchia pounced on a perfect Supertubes runner and unloaded three huge under-the-lip hacks before pulling into a long, dredging tube. The Hawaiian earned the highest single-wave score of the day as he came flying out with his arms raised aloft. Searching for two scores to take the lead, Logie used his trademark speed and power to muscle his way out of the combination, clocking a 7.17. But Patacchia found another bomb and tore it apart to for an 8.00 and the second highest two-wave heat total of the J-Bay Open, bettered only by event favourite Jordy Smith’s 19.80 in Round 1. A call will be made at 7am tomorrow (12 July) Sunday morning on whether to commence with Round 3 action.